The year was 1968. The world was muddle-wonderful. I was just a kid, just three years old, but the late sixties are certainly one of my favorite times of fashion, music and art. I remember the way everything looked: colorful, naive, fresh faced. I'm still drawn to things from that time. 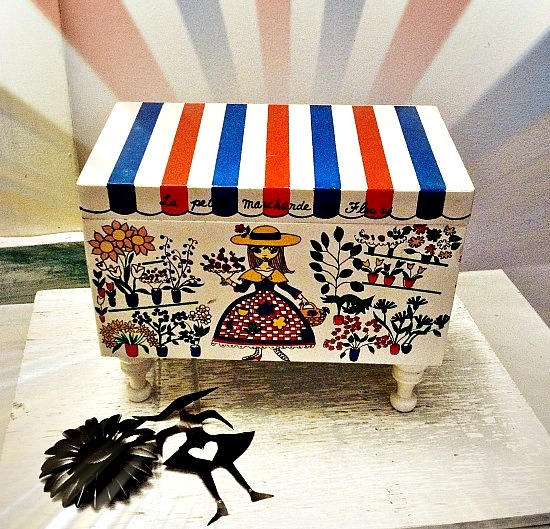 Like this vintage 1968 music box. What a sweetie, that petite cherie. 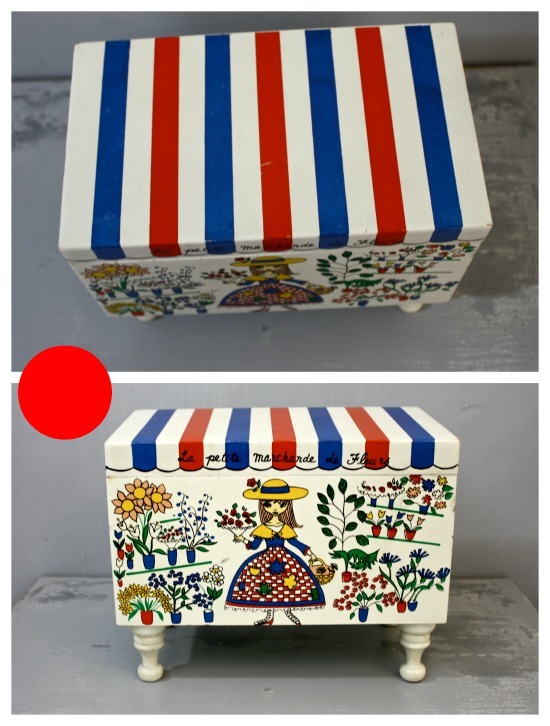 I love the hand-painted French flower market girl, the bold red, white and blue stripes on the lid, and the spindly wooden legs. Open up the box, and the thing stills plays, albeit high on cough syrup. Song goes a little wobbly, but determined. I couldn't quite place the melody- but it sounds so very period late 1960s. 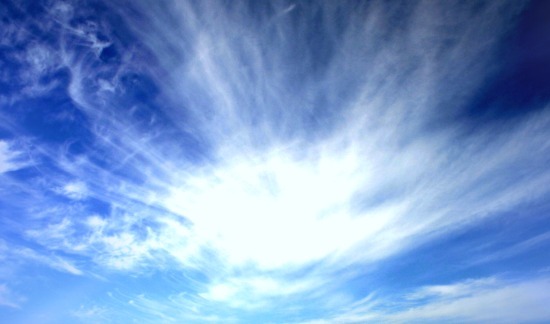 A sky symphony of sorts, is happening as I type this: a day full of rainy cloud burst. Feeling a bit of cloud burst myself, I'm shuttered up in the house as I watch the rainwater fill a bowl full of sea shells that I've left outside. And, there's music out there: the staccato rainfall, a deep rumble of a passing bus, a neglected smoke alarm, a plane zoom, and some birds calling out in a thicket, like back-up singers at a rehearsal. A string section is playing in my head, residue from the influence of a syrupy sadness, from a few recent reminders of inevitable finales. At once very grateful to be alive, I'm also bone weary from this recent soundtrack of heartache. 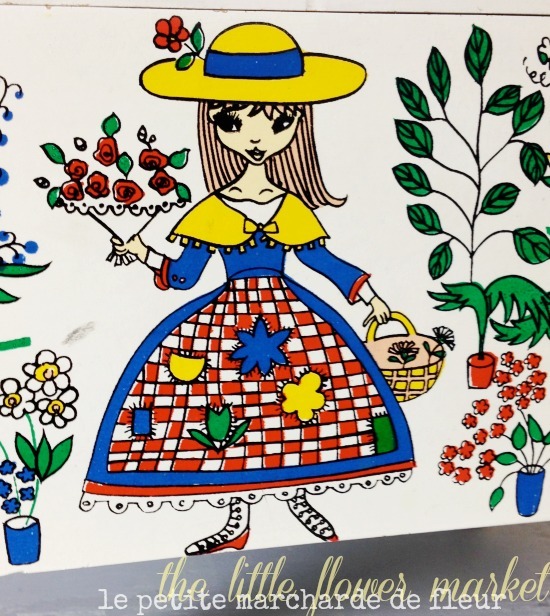 La petite Marchand de Fleurs: not to put the flowers before the cart, but there's an absurd loveliness about all this skyward symphonic meaningful randomness. Beneath a wide sky brimming with beauty and wonder, I see we are each a spindly, leggy music box, turning out our own syrupy melodies, until the very last wind. Poetic! Your writing is magical, as is this music box. You're a seriously gifted writer, Bella. I'm sorry you're going through some trying times.